The life my eyes focused on hung in agony on a cross beside Jesus, where suffered a scoundrel, a man fully deserving to endure agony. Yet, it was not even this thief’s life I saw, for Scripture gives no details on that man’s life. The sinner who hung on that cross in my mind’s eye was my own father, and the flashing pictures of his life were stark with painful truth. Affected by generational sin, instinctively claiming shame. Struggles, temptations, failures. Choices and consequences. That Easter, I had just learned he was dying and was trying to decide if I would travel across the provinces to see him. The decision was made for me, as he died the next morning. My father had hurt me. Deeply. Into my soul. In ways no little girl should ever be hurt. It had taken years, but I came to terms with that pain and began moving beyond the shame. I had forgiven my Dad, perhaps more for me than for him. My father had stolen from me and like the thief on the cross, he deserved to die for his choices. Didn’t he? Yet Jesus offered him eternal life in glory. like the thief, forgiven and in God’s presence today. And that is as it should be because I am also represented by one of the thieves who died with Jesus. I too have the choice to reject and mock the power of Jesus or to ask for life. I too am affected by generational sin, instinctively claiming shame. I struggle, face temptation, and fail. I too make choices and live with the consequences. 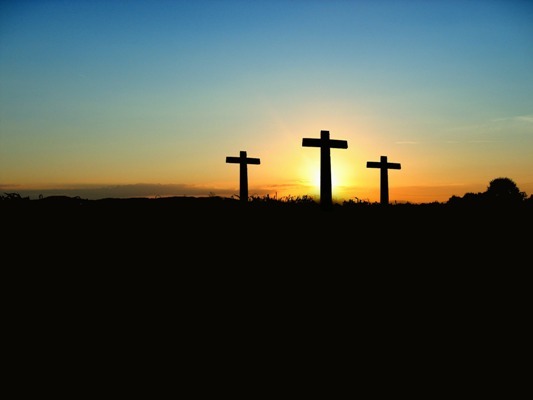 God provides forgiveness and life through the Christ we remember at Easter. Immanuel, who provided the way. He defeated death. He lives. He offers each of us life with God. And so, we have a choice to make before our life on this world ends. Like the thief, I am undeserving. Like the thief, I am repentant. Like the thief, I still suffer the consequences of my choices. Like the thief, I am forgiven and walking with God today. I am living this day of eternity. I am living with and for Christ. I have made my choice. Your testimony shows what forgiveness is about, Marnie–both for the forgiven and the one who forgives. God, through Christ and with Christ, shows his great love for all of mankind and his powerful ability to forgive.. You really do have a story and a message, Marnie. Thank you for sharing your story so that God may use your story to help others who have abused or been abused. God is love. Powerful stuff, Marnie – and a message so many need to hear. I am sorry to hear you were betrayed by your father! That your trust was betrayed! That you weren’t protected by your father.prayers for your healing! But Chris, I was totally protected by God, my Father. God’s presence made all the difference! Eatrhly Father if a Real Man protects his children too!